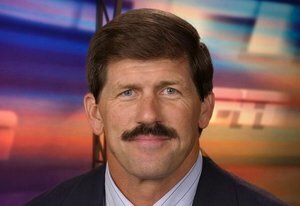 Todd Jay Christensen was a professional football player and television sports analyst. He was a member of The Church of Jesus Christ of Latter-day Saints. Christensen was born on August 3, 1956, in Pennsylvania. The family moved during his early childhood to Eugene, Oregon, where his father was a professor at the University of Oregon. Christensen excelled in many sports. He played football at Brigham Young University and started all four years as a fullback. He was drafted in the 1978 NFL draft by the Dallas Cowboys. He broke his foot in the final exhibition game and was placed on the injured reserve list, missing his opportunity to play in Super Bowl XIII. He was later waived when he didn’t agree with his move from fullback to tight end. The New York Giants claimed him off waivers, but he played only one game with the team. The Oakland Raiders signed Christensen in 1979, where he played tight end until his retirement in 1988. While with the Oakland/Los Angeles Raiders, he had a few stellar years. In 1982, he caught 42 passes for 510 yards and four touchdowns, helping the Raiders claim the best NFL record. The following year he caught 92 passes for 1,247 yards and 12 touchdowns and went to the first of five trips to a bowl game. He led the NFL in total catches and became the second tight end to ever achieve this. In 1984, he passed over 1,000 yards again and caught 82 passes. The following year he caught 80 passes for just under 1,000 yards. His 1986 season was his best as he achieved a career-high with 95 receptions for 1,153 yards and eight touchdowns. He also became the first tight end in history to catch 90 passes in each of two consecutive seasons. His final season was marred by injuries and he decided to retire. During his career, he won two Super Bowl championships. Following his retirement from football, Christensen stepped into some of the sports where he excelled in high school. He had tryouts with the Oakland Athletics and the Anaheim Angels, but landed in Masters Track and Field, where he set an age-group World Record in the heptathlon. He was the top decathlete in the world for ages 45-and over. He later became a broadcaster and co-hosted the second half of the first season of American Gladiators. He later was a color commentator from 1990 to 1994 for NFL on NBC. He also did commentary for ESPN’s college football coverage, then moved to MountainWest Sport Network until it shut down in June 2012. In August he was appointed as the new analyst for CBS Sports Network Navy games. Christensen earned his bachelor’s degree in social work from BYU in 1980. He was inducted into the BYU Hall of Fame in 1992; in 2000, he was inducted into the Oregon Sports Hall of Fame. He and his wife, Kathy, had four sons. Christensen unexpectedly died on November 13, 2013, while having liver-transplant surgery. He had suffered from liver damage for several years following what the family considered a “botched” gall bladder surgery. His obituary noted that “In every arena of his life, Todd sought earnestly for self-improvement because of his love and understanding of the Plan of Salvation and the Gospel of Jesus Christ. As much gratification as he received from training his body to peak efficiency, he took greater pleasure in pursuits of the mind, rarely leaving the house without his journal, scriptures and books he was reading.” He was nicknamed The Renaissance Man due to his varied interests and wide vocabulary. He self-published three books of poetry. He worked to become an accomplished operatic tenor. This page was last edited on 19 June 2015, at 22:39.